3rd December is International Day of People with Disabilities, when we focus on the contribution that men, women, girls and boys with disabilities make to their families, communities and societies – and highlight the benefits for everyone of greater inclusion. This year, our focus for the day is on economic inclusion and work. It is nearly 70 years since the UN Universal Declaration of Human Rights set out the right to work. According to Article 23.1 of this landmark document: “Everyone has the right to work, to free choice of employment, to just and favourable conditions of work and to protection against unemployment”. But for many, the opportunity to earn a living is out of reach - people with disabilities face lower employment rates across both high income, and low and middle income countries. In particular, those with mental health conditions or intellectual disabilities face the lowest employment rates. Men and women around the world face major barriers to finding a job or earning a living. These barriers include lack of access to education and training to gain skills and qualifications; stigma and prejudice, such as assumptions from employers that disabled people will be less able or productive; physical barriers to, and lack of reasonable accommodation in, the workplace; and, in some places, over protective laws or social security systems that make it difficult to transition from benefits into employment. Those seeking self-employment may also face discrimination when seeking credit or loans. In many parts of the world, people with disabilities in work are more likely to be in vulnerable forms of employment. For example, in Indonesia 63% of people with mild disabilities in work are self-employed, compared to 34% of those without disability; and in Mongolia men and women with disabilities are four times more likely to be employed in the informal sector than people without disabilities. This exclusion impacts on individuals in a number of ways. Critically, exclusion from work affects the income of an individual and often their household, and the circular link between disability and poverty is well known. In South Africa, for example, it is estimated that people with severe depression or anxiety earn only half the average national income. In Uganda, 77% of households including a person with a severe disability face multi-dimensional poverty, compared to 69% of other households. There is a strong link between being able to control your employment options and emotional wellbeing. 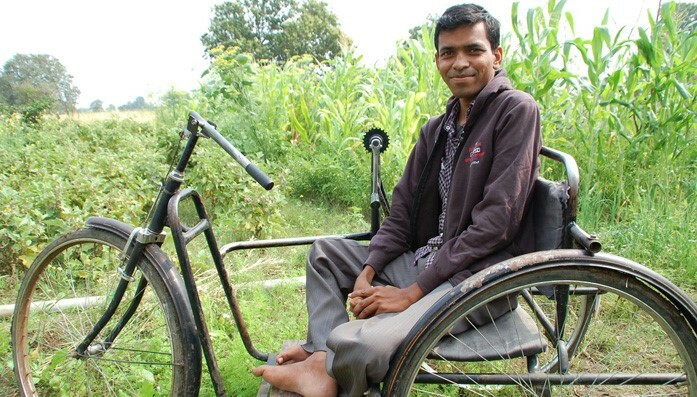 Rajesh, a CBM beneficiary from India, faced attitudinal barriers, including from his family, because of his disability. “I have always tried to help with the farming, but my abilities were not recognised in the family, or in the wider community. I used to sit under the porch and feel really down. I used to focus on what I couldn’t do, rather than on what I could”. During a visit to Tanzania, I met women receiving treatment for fistula, a disabling condition that leaves women incontinent, often for many years. Many of these women had become socially isolated and, when combined with the practical difficulties of managing incontinence while living in poverty, this meant that they struggled to earn an income. As well as medical treatment, CBM’s partner provides training in a range of skills which mean that the graduates of the year-long scheme can choose which of the skills they have learnt they will use to develop their own business, such as making bags. Equally importantly, they gain confidence in literacy, numeracy and business skills to ensure more solid foundations for their small business. This holistic approach is vital to helping recovery – work is not only a way to earn an income and reduce dependency on others but also helps build a sense of purpose and self-respect. The exclusion of people with disabilities from work also has an impact on wider society and national economies. For example, it is estimated that the exclusion of people with disabilities from the labour market amounts to losses in lower and middle income countries of US $473.9 - 672.2 billion a year, because of lost labour productivity. Conversely, the benefits of inclusion in the labour market stretch from the individual and their household, to society and the economy, for example in potential reduced spending on welfare and increased tax revenues. CBM works with partners across the world to enhance opportunities for people with disabilities to earn a living. In Rwanda, our new livelihoods programme will help increase financial independence through Village Savings and Loan Associations (VSLAs), a proven approach that supports small groups of people to save together and take small loans from those savings, which can be used to set up small businesses or invest in income generating activities. Our organic farming programme in India has enabled people such as Rajesh to learn organic farming techniques - and go on to grow and sell produce, attracting a growing and loyal customer base. As well as increasing his income and self-esteem, Rajesh’s inclusion in work has helped to change attitudes to disability. Initiatives such as ours must be accompanied by continued efforts from governments and intergovernmental institutions to not only remove barriers to work for people with disabilities but also create positively disability inclusive policies on work and employment. Governments must develop and implement their national policies to achieve the targets in Sustainable Development Goal 8 on full and productive employment and decent work for people with disabilities, as well as targets in Goal 11 to ensure accessible transport systems so that a person with a disability can travel to work. We welcome the UK Government’s commitment to prioritise economic inclusion for people with disabilities in the world’s poorest places. This week, we hope that the Secretary of State for International Development Penny Mordaunt will re-iterate this commitment when she speaks at an event organised by CBM and other disability and development organisations (members of the Bond Disability and Development Group) to mark International Day of People with Disabilities. It’s vital that governments such as ours maintain commitments made to people with disabilities though development work and aid budget, ensuring that disability remains a priority, including through programmes that address livelihoods and income generation. Breaking down the barriers to work that so often trap men, women and children with disabilities in poverty is vital if we are to enable every person to fulfil their potential and build a world where nobody is left behind. In the next week, as we prepare for International Day of People with Disabilities on Sunday, we’ll be sharing stories of economic inclusion from around the world – visit our Facebook page to find out how men and women with disabilities are earning a living and changing attitudes from Tanzania to Vanuatu. Images: Top - Rajesh has been helped by CBM's organic farming scheme in India. 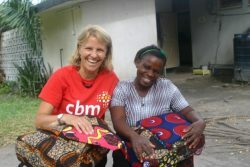 Middle - Kirsty on a visit to CBM's fistula programme in Tanzania. 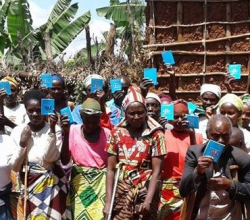 Bottom - CBM has launched a new livelihoods programme in Rwanda. How far did you travel for your glasses?